The once I get in front of someone scenario and generating a real lead. 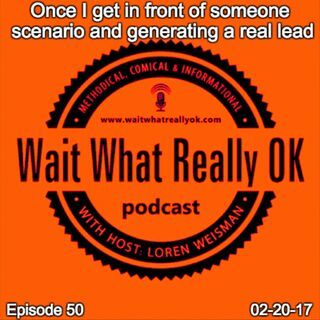 Wait What Really OK Podcast Episode 50 hosted by Brand Precision Marketing Strategist and Counselor, Loren Weisman discusses the once I get in front of someone scenario and generating a real lead with people today. This episode discusses the preliminary pieces from videos to audio pitches and explanations that can be helpful for your pitch or connecting with those you haven’t met yet. So many are focused on the idea ... Más informaciones of needing to be in front of some one, while preparing the materials to be able to easily send in short bits to open up doors and make a potential lead, an actual lead. Here are a few links to my short and medium and long pitches as an example. Have the pieces available to give people that introduction with out you there to build a starting connection so that when you meet, you can move forward faster. The once I get in front of someone scenario and generating a real lead of the Wait What Really OK Podcast is available on iHeartRadio. Podcast Blog Supplement for Episode 50 of the Wait What Really OK Podcast with Loren Weisman. Podcast Link Supplement for Episode 50 of the Wait What Really OK Podcast with Loren Weisman. How do you handle online and offline content exclusivity for the best results? Podcast Video Supplement for Episode 50 of the Wait What Really OK Podcast with Loren Weisman. Podcast Photo Supplement for Episode 50 of the Wait What Really OK Podcast with Loren Weisman.